Today’s companies are operating leaner than ever to remain competitive. This includes doing more with less people, and infringing on the premise of “office hours.” How can you encourage your employees to stay in the office longer, while being more productive, and all the while not destroy morale? Consider adding a micro market. 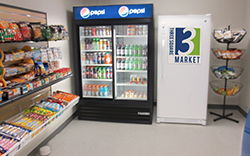 Our 3 Square Market service essentially turns your break room into a fully self-supporting convenience store. 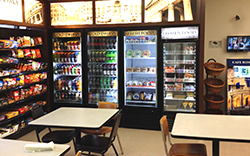 The attractive fixtures, efficient coolers and hundreds of products are all there to transform your employee space. With so many options right on site, people are less likely to leave the office for lunch…and more likely to burn the midnight oil to get projects done. All the while, they’ll see this as a great fringe benefit of working for you. So who runs the store? No worries, it runs itself. 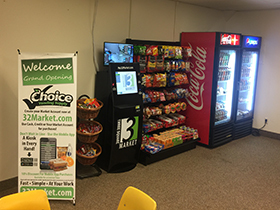 Integrated self-checkout kiosks allow people to select their items, scan them, swipe a credit card or store value card, and head back to their desks to enjoy. Also, restocking is simplified with our web-based inventory management system. Another aspect that makes a micro-market great is people can touch, feel and read the nutritional information before making a selection. 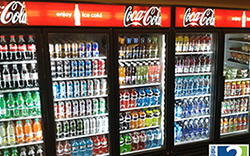 Furthermore, the hundreds of products one can choose to stock include many healthier items, something that is becoming more and more important with consumers. Sure, an in-house store would be great, but you don’t have time to police it. That’s where the integrated security system comes into play. 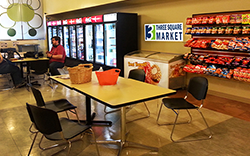 Complete with video cameras and signage, the markets we’ve installed have had virtually no instances of theft. 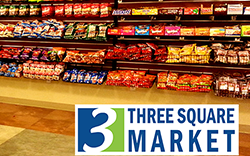 What’s the biggest advantage of micro markets? Variety! 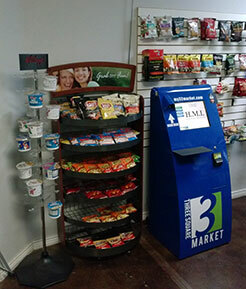 With the self-checkout kiosk we can offer products and sizes that traditional vending can’t.